Development of commuter channels continues to be a priority to ease traffic in and out of the Santa Clarita Valley. We talk a lot about Santa Clarita Valley neighborhoods being “commuter friendly,” and while some of you may have differing ideas about just what “commuter friendly” actually means, as the Santa Clarita Valley continues to develop, there are many steps that are taken to insure traffic flows as smoothly as possible in and around the SCV. Many commuters travel to and from their destinations south of the SCV, such as the San Fernando Valley and greater metropolitan Los Angeles area by way of the Newhall Pass. The Newhall Pass, while being named for Henry Mayo Newhall, was actually discovered by Gaspar De Portola in 1769. Back then, it wasn’t an easy trek over the pass in either direction, which made the Santa Clarita Valley a rather remote place to settle and live. Prior to it being called the Newhall Pass, this accessway was known as the Fremont Pass until the late 19th century. You think you have it rough today when you’re following the big rigs up the hill of the Newhall Pass? Imagine trying to fit through a slit in the hillside barely wide enough for your buckboard wagon! Completed in 1864, Beale’s Cut was named for Edward Beale, who maintained the passage and collected tolls for the next twenty years or so. 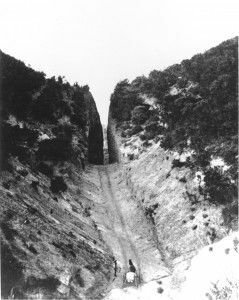 The cut was eventually deepened to 90 feet, and was in use for travelers to and from the Santa Clarita Valley until 1910 when the Newhall Tunnel finally opened. 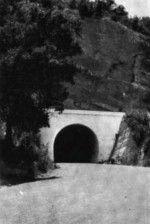 The Newhall Tunnel officially opened to traffic on December 21, 1910. At 435 feet long, 17 feet high and 17 and a half inches wide, this tunnel was entered by commuters with at least a little trepidation. It was said that some of the larger trucks actually had to let some of the air out of their tires to insure they could fit through this tunnel. Two way traffic was almost impossible in this narrow passageway. The Ridge Route connected the Santa Clarita Valley to Kern County and was officially known as the Castaic-Tejon Route when it opened in 1915. This was the first paved highway linking the Los Angeles Basin with the San Joaquin Valley, and played a crucial part in agricultural commerce in the first part of the 20th century. The Ridge Route picked up at Castaic Junction (At Highway 126) where San Fernando Road ended. From there, commuters took a slow, windy two lane highway to California’s central valley. In 1937, Highway 99 was extended originally as a 3 lane highway through the Santa Clarita Valley along what is now known as The Old Road. With an additional lane added in the 1940’s, this was the main highway route to and from the Los Angeles and San Fernando Valley through the Santa Clarita Valley until 1971, when Interstate 5 extended north through the SCV. Nowadays, Interstate 5 and Highway 14 are the main arteries in and around the Santa Clarita Valley. Known as the Antelope Valley Freeway, Highway 14 begins at the southern base of the Newhall Pass and takes commuters through Newhall, Canyon Country, Agua Dulce and Acton before continuing on to the Antelope Valley communities of Palmdale, Lancaster, and Mojave, CA. The roadways connecting the Santa Clarita communities have expanded over the years as well. With the extension of Copper Hill on the north end of the City of Santa Clarita, North Valencia and Saugus residents now have easier access to the Valencia Industrial Center and Interstate 5. The Cross Valley Connector finally opened completely to commuters who can now easily travel the SCV from east to west, and vice versa. This nearly 10 mile section of road connects Newhall Ranch Road in Valencia with Golden Valley Road at the edge of the Saugus/Canyon Country border, and runs from the 14 freeway at Sierra Highway to Interstate 5 at the 126. The local bus service, known as Santa Clarita Transit, has routes that crisscross the Valley and provide access to every major business, shopping, and commuter access points, including the three Metrolink Train Stations here in town. Aside from providing public transportation in Santa Clarita, the transit system also has express buses that take commuters from Santa Clarita to North Hollywood, UCLA, Woodland Hills/Canoga Park, and Union Station in Los Angeles. With the opening of the first Metrolink Train Station on Soledad Canyon Road in the early 90’s, commuters have enjoyed a traffic-free ride to the San Fernando Valley, downtown Los Angeles, the Antelope Valley and beyond. Expanding to 3 stations (One located on Via Princess in Canyon Country, and the other in Downtown Newhall), Santa Clarita residents have been able to enjoy easy access to these stations from practically anywhere in the SCV. 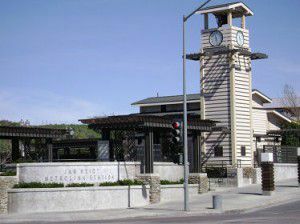 The City of Santa Clarita also offers many convenient locations for commuters to park for free and take advantage of the various transit methods. Click here for a complete list of Park and Ride locations. Santa Clarita is a great place to live! Is it time for a move? Are you ready to experience the friendly atmosphere and family-oriented community of Santa Clarita? Contact us today with your questions about this wonderful area. Call Montemayor & Associates at any of the numbers listed at the top of this page, or shoot us a message using the quick response form below.